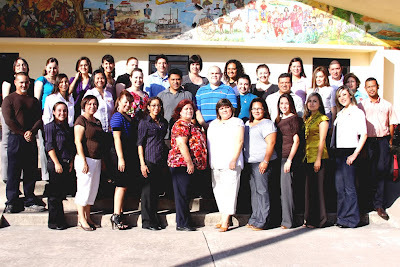 Rio Grande City CISD Hosts New Teacher Orientation on Friday, August 13, 2009. Mr. R.C. Salinas served as Master of Ceremonies for the event . Jennifer Diaz-Senior class President delivered The Invocation by followed by Pledge of Allegiance which was lead by Heriberto Montalvo. Mr. Basilio Villarreal, Jr,-RGCCISD Board President welcomed the new educators to the best district in the state of Texas. He also commended the students, parents and district personnel for their excellent academic achievement. Mr. Roel Gonzalez-Superintendent welcomed the new teachers and offered guidance and support. The program continued with a welcome given by Mr. Gilberto E. Garcia-Assistant Superintendent for Human Resources who wished the educators and their students a successful year. He asked the educators to place the RGCCISD pin given to them on their collar or lapel and declared them official Rio Grande City Rattlers. Mr. Jorge Recio - High School Principal addressed the audience with encouraging words. Mrs. Thelma Ramey-Assistant Superintendent for Business and Finance and her staff were at hand to assist the new teachers with insurance and payroll information. The Department of Human Resources Personnel was available to facilitate the transition into the district. Mr. Rey Ramirez-City of Rio Grande Commissioner and RGCCISD Athletic Director welcomed the educators on behalf of the Rio Grande City Mayor and City of Grulla Mayor. "You have joined a great family" said Ramirez during his address to the audience. Mr. Arcadio Salinas III - Admission, Attendance and Safety Coordinator spoke to the new teachers on safety issues. His staff was also available with safety information to disseminate. The new educators were treated to a guided historical tour of the city in the Trolley by Mr. R.C. Salinas-Local Historian and Mr. Hernan Garza IV.